The Doug Ford government risks endangering the public and damaging Ontario ecosystems with its proposed double-crested cormorant hunt, according to its own wildlife experts. Ontario's Ministry of Natural Resources and Forestry (MNRF) asked its staff for feedback on the creation of an annual cormorant hunting season from March 15 until Dec. 31, as well as making Ontario the only province in Canada to remove the bird from protected status. Not many people like cormorants, but should hunters be allowed to kill 50 birds per day? Cormorant populations declined from the 1950s to the 1970s but have since rebounded. In some locations, commercial fishers and property owners say the birds have reduced fish populations, and that their acidic feces have damaged island forests, shorelines and other areas. But documents obtained under Freedom of Information legislation show widespread pushback in late 2018 and early 2019 against the proposed hunting season from wildlife experts within the ministry. They suggest the government should rethink the plan altogether, citing concerns that include the potential for endangering the public. A three-page report from staff at the ministry's southern region office noted many cormorant colonies are situated on lakes "used heavily for recreational use" in the summer. "To have a hunting season in combination with these uses could create conflict between hunters who can shoot [cormorants] on the lakes and islands mid-summer, and people boating and cottaging on a lake," the report reads. The report also highlights concerns about how a cormorant hunt might affect other bird species that cormorants often nest with, namely great egrets and black-crowned night herons, during their critical nesting seasons. There's also concern about the proposed daily kill limit of 50 — the highest of all game birds. "Given the proposed bag limit of 50 [cormorants] per day and a proposed season length of 291 days, an individual hunter could harvest up to 14,550 ... per season," northwest region staff wrote in their report. "If implemented as proposed, a liberal bag limit has the potential to decimate the colonies on Rainy Lake in a very short matter of time (eg. hours, days)." The 50-bird limit was also contentious among the staff writing up the proposal for the minister's office, with some civil servants pitching a lower limit of 10 right up to the day the proposal was made public. One policy analyst wrote in an email that a high limit might incite legal action. 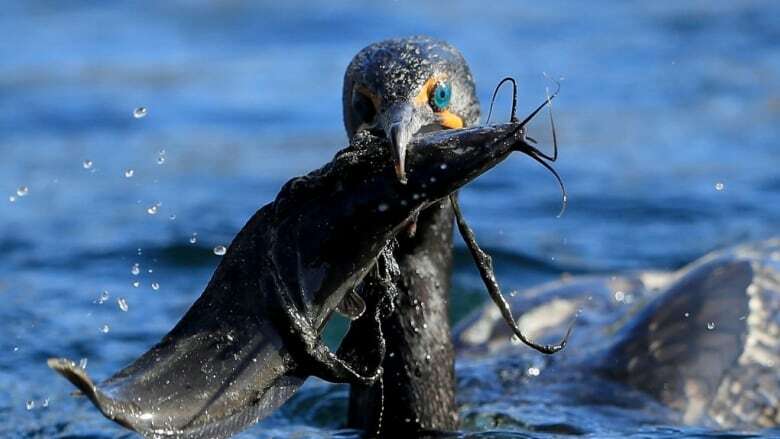 "There is a risk a high bag limit will inflame the concerns of those who do not support cormorant hunting and compel them to challenge the ministry legally on this proposal," the analyst wrote. In the end, the ministry stuck with 50. Other feedback suggests some experts think the proposed solution is not evidence-based. "The implication that introducing an open season for cormorants could improve recreational or commercial fisheries is not supported by science," wrote one report author. "It undermines the integrity of the MNRF as a science-based, sustainability-focused resource management agency." Staff at the northwest region office asked whether moving ahead without the science to back it up would "impact MNRF credibility." "Could not MNRF examine the hypothesis through a research project?" their report suggested. Staff at the North Bay district office also recommended that the ministry take a step back and assess whether a province-wide hunt is required. The minister's office discarded an earlier recommendation contained in a briefing note signed by Deputy Minister Bill Thornton in October, which called for the province to first assess the cormorant population by reintroducing widespread monitoring — a practice that ended a decade ago — before deciding whether a hunt is necessary. The briefing note suggests a hunt "could lead to a rapid decline in cormorant numbers," and warns about the potential consequences of a hunting season on the rest of the ecosystem. "Cormorants are a native species and an important part of aquatic ecosystems. Significant reductions in cormorant abundance could have impacts in other parts of the ecosystem, including predators," it reads. The request for internal feedback took place at the same time as the public consultation, which ended in January. The ministry on Thursday would not confirm whether the hunt will go ahead today. "Public consultation on the proposed hunting season has closed, and we are in the process of reviewing all feedback received before making any decisions," MNRF spokesperson Jolanta Kowalski wrote in an email. "[The government] is taking action in response to the concerns expressed by our commercial fishing industry, property owners and individuals that double-crested cormorants have had a negative impact on the environment."